We’re all familiar with the harsh concept of prison, as it appears in western literature and film: from The Count of Monte Cristo to The Shawshank Redemption, prison is normally presented as harsh and intolerable, a hell on earth second only to war. And imprisonment in oriental jails is often represented as even worse -- from Midnight Express to The Bridge on the River Kwai. It is therefore quite a change to see prison -- and Japanese prison at that -- represented in a calmer manner. In fact, On Parole sometimes make you miss prison. After all, life was so simple and understandable there for protagonist Shiro Kikutani, who spent 16 years behind bars for a crime that is not explicitly revealed until halfway through the book. Life in prison had its rhythm, everything was easy to understand and there was nothing strange to cope with. Yet Kikutani, like any inmate, yearns for the freedom of the outside world. 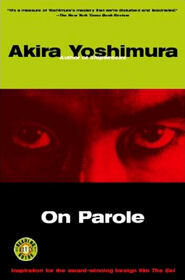 The book begins as Kikutani is released, on parole. This is a classic opening scene in movies, but Kikutai has no band to put back together. He has to try and re-build his life from scratch. He cannot return to his old community, as much because of shame as because of his terms of release. He has to find a new job. He has no friends, no property, and -- it seems -- no prospect for success. The problem of integrating ex-convicts back into society is a complex one, and parole officers -- whose role ranges from that of a friend to an elder brother, even a surrogate father -- do their best to help. More than just social problems, Kikutani is also faced with accelerated future shock: the world has changed greatly in a decade and a half, and just seeing those changes on TV is nowhere near living through them. The comparison between the lives of modern people, Kikutani now amongs them, and the chickens in the farm where Kikutani finds work, is almost inevitable; and those chickens had their beaks clipped, to prevent them from pecking one another to death. Kikutani does make an effort; and it seems like he is on the right track. True, shadows from his past, like random encounters with fellow inmates, sometimes haunt and set him back; but the prospects look promising. He even has a chance for establishing a new family. As we approach the end of the book, it almost seems like Yoshimura has written a short, sweet idyll of rehabilitation, a hero overcoming the objective difficulties through sheer force of will and acceptance of his past mistakes. Except that’s not the case. The key subjects of the book seem to be remorse on one hand and forgiveness on the other; forgiveness both on the side of the victims and on the side of society in general. Can a person achieve redemption -- make amends with his inner self, and with his society -- without both finding remorse and earning forgiveness? Yoshimura’s style is calm, almost minor; the pace is very slow, with fine attention to detail. It is these small details that make the book such a fascinating read, and the style, in turn, serves to enhance the shock as the plot twists and turns.